Bruges (Brugge in Dutch; pop. 45,000, or 117,000 with the suburbs) is the capital of the province of West Flanders and Belgium most popular tourist destination. 2 million visitors flock to this perfectly preserved medieval town each year. Endowed with romantic canals and picturesque little streets, Bruges has been dubbed the 'Venice of the North' and certainly deserves its reputation. 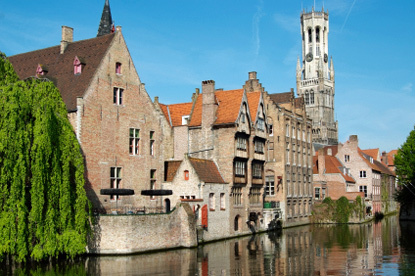 Bruges was founded in the 9th century by a group of Danish Vikings. The name 'Bruges' probably comes from the Old Norse word Bryggja, which means 'landing stage', or 'mooring place'. Towards the end of the 9th century, Baldwin the Iron Arm, first Count of Flanders, fortified the city, ironically to protect it against other raiding Vikings. Bruges developed as a port, directly accesible from the sea until about 1050 CE. Then the natural waterways silted up, but Bruges remained connected to the sea via the Zwin canal until the 15th century, though via outports like Damme and Sluis. Bruges grew as one of the main textile manufacturing and trading centres in Europe, along with Ghent and Ypres. In 1300, Flanders was annexed to France by King Philip IV the Fair. The king visited Bruges the next year, and his wife, Joanna of Navarre, was so impressed by the prosperity and opulent attires of the locals that she said "I thought I alone was queen, but I see that here I have 600 rivals". In 1302, Philip IV imposed a new tax on Flanders, and even took the two sons of the Count of Flanders, Guy of Dampierre, in hostage. This caused great unrest in Flanders and in the morning of 18 May 1302, the citizens of Bruges murdered all the Frenchmen in their city, identifying them by their pronuciation of the Flemish phrase schild en vriend ("shield and friend"). Everyone who had a problem pronouncing that, was killed. The massacre is known as "Brugse Metten" ("Bruges' Morning"). Philip the Fair angrily sent 10,000 well-armed knights to punish the citizens of Bruges, but they were defeated by a militia of Flemish guildsmen near Kortrijik at the Battle of the Golden Spurs on 11 July 1302. In the 1300's, Bruges became the Headquarters of the Hanseatic League of 17 cities, and became so international that one could find almost any exotic product and hear English, French, Italian, German or Spanish spoken in the streets of the city. 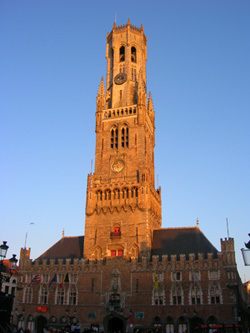 Bruges' golden age continued in the 15th century under Burgundian rule. The city sprouted great Flemish painters like the Van Eyck brothers and Hans Memling. By 1500, Bruges' population had boomed to 200,000, twice the size of London at the time - and twice its size now. It is in Bruges that the first ever printed English book was published in the Renaissance. But in the 16th century, the Zwin had now completely silted and the headquarters of the Hanseatic League and the merchants moved to Antwerp. The split from the Netherlands in 1584 led to the final decline of Bruges. 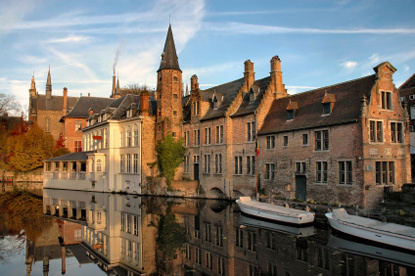 From 1600 Bruges had become a backwater (without pun intended) and was to remain that way for the next three centuries. In 1907, the construction of the Baldwin Canal between Bruges and Zeebrugge ("Sea Bruges"), 15 km north, gave a new impulse to the city. As with other major Flemish city, the Grote Markt (market square), Belfort (belfry) and Lakenhalle (cloth hall) are not to be missed. The 83m tall Belfort was built in 1240 and is listed by the UNESCO as World Heritage Site. Visitors can climb to the top using the 366 steps staircase and admire the 47-bell carillon from the 18th century. The size of the cloth hall under the belfry is a witness of Bruges' past active economy. In 1399, there were 384 sales stands inside the hall. The statues of Jan Breydel and Pieter de Coninck, heroes of the Battle of the Golden Spurs, stand in the centre of the square. Take Breidel Street south-east of the Grote Markt, and you will reach Burg Square, the former administrative centre of the city. There once stood Bruges' castle and St. Donatian Cathedral. The castle was constructed in the 10th century by Count Baldwin I, while the cathedral was even older, founded in 900, replaced by a 12th century Romanesque structure, which was eventually torn down by French Revolutionaries in 1799. Provincial government building at night, Bruges. 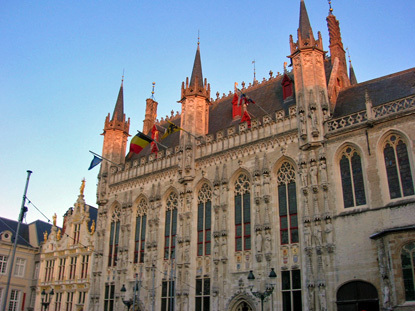 The Gothic Stadhuis (town hall), built between 1376 and 1420, is arguably the most beautiful town hall in Belgium. There are 48 niches and replicas of the statues of counts and countesses of Flanders. The original were destroyed during the French Revolution. Next to the town hall, the Brugse Vrije ("Liberty of Bruges") was an administrative building erected in 1531. The enormous chimney piece in the Renaissance Hall is remarkable. The Romanesque Basilica of the Holy Blood owes its name to the relics of Christ's blood brought back from the Holy Land by crusaders the late 12th century. Other buildings embraces all architectural styles, from the Renaissance Old Civil Registry to the Baroque Deanery and Neo-classical former Court of Justice. Bruges boasts one of the highest ratio of Michelin stars per capita in the world and rivals Brussels as the culinary capital of Belgium. 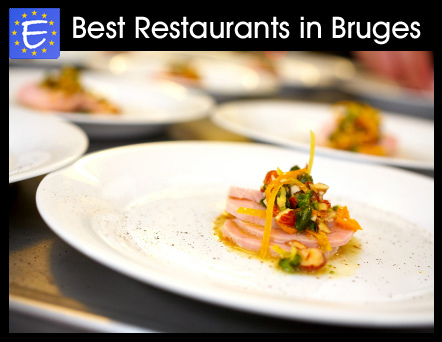 Check out our list of best restaurants in Bruges. 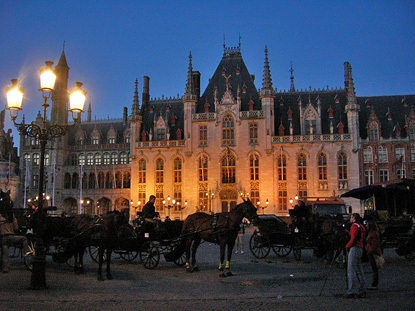 Bruges can be easily accessed by train from Ghent (22 to 38min), Antwerp, (1h20min) or Brussels (50min to 1h). By car, take the E40 from Brussels , Ghent or Veurne, N49 from Antwerp, E403 from Kortrijk or Tournai, or N9 from Ostend.